As the demand for precious metals shows some life once again, sales of the U.S. Mint Silver Eagles jumped in January. Not only have Gold, and Silver Eagle sales increased, so have the precious metals prices. In the past two months, gold and silver prices have gained 7% and 11% respectively. Today, gold reached $1,320, while silver topped $16. Thus, Silver Eagle sales have increased nearly 25% more than the same month the previous year. 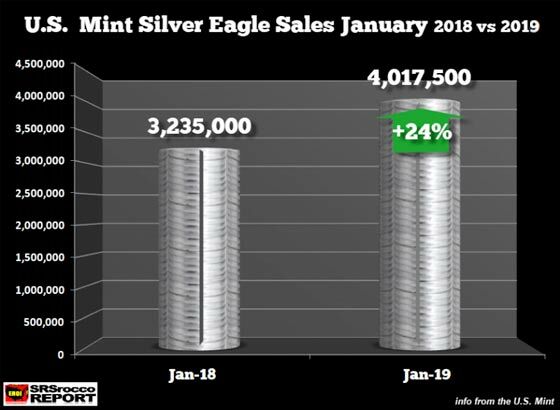 While it is true that overall Silver Eagle sales have been much lower than the peak of 47 million set in 2015, it is good to see an uptick in demand. Furthermore, Gold Eagle sales for January rose by more than 10% to 64,500 oz versus 58,500 oz last year. As we can see, total Silver Eagle sales in 2018 were 67% less than the peak in 2015. However, sales are still much stronger than before the 2008 Financial Crisis. In 2007, annual Silver Eagle sales were a little less than 10 Moz. If the situation in the economy and markets continue to deteriorate this year, I believe we are going to see much stronger Silver Eagle sales than the 15.7 Moz last year. The Dow has now pushed up against the 100 and 200 Month Moving Averages (MMA). It will be interesting to see what happens tomorrow. The Dow has increased 15% off its lows on Christmas Eve. 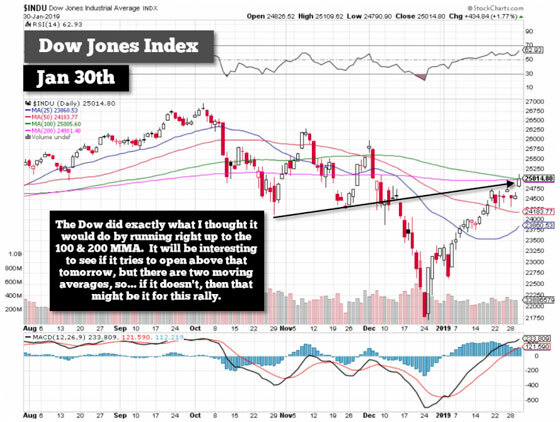 I still believe the present rally in the markets is now running out of steam and may peak in the next few days. Regardless, I will be posting a new series of articles on the coming rise of the Millenial Generation of precious metals investors. I will start with coverage on the impending disaster in the U.S. State and Local Government Pension system. However, I was quite surprised to find out that the majority of my followers, were not 50+, but the majority were in the 25-34 age bracket. Yes, it is true that the younger generation uses the internet more than the old farts, but it was quite interesting to see that this age group was very interested in the Alternative Media and precious metals.